The fallout of Arsene Wenger's radio interview continues, as the press pick up the quotes for the first time and try and spin them in ways they see fit to fill their own agendas. I think the most interesting insight we've been given is the current predicament faced over Samir Nasri's contract negotiations. Very rarely will you hear the manager talk so openly about Arsenal's affairs and when it comes to money that's usual a subject which cannot be talked about. "Regarding Nasri, one thing is absolutely sure, that we will not sell him to Manchester United. We have a financial disagreement with the player, and I will work on it during the summer, to ensure he will extend his contract." The Daily Mail speculate that Nasri and his agent want £110,000 a week - which according to them is what Cesc Fabregas earns. With Nasri entering the remaining 12 months of his contract, he has the stronger hand at the table. If he really wants £110k a week, he'll easily get it, if not more at Manchester City. And because the new contract hasn't been sorted out until now, it appears Nasri wants Arsenal to pay him to renegotiate his whole contract and start from afresh, as if he was signing for us on a free transfer. This would include a nice chunk in a signing on fee, going straight into his bank account. 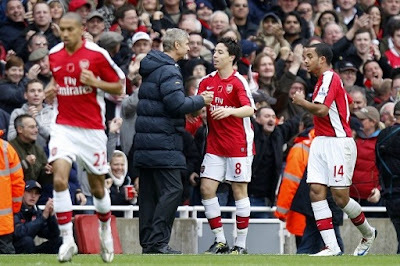 I have no idea what Nasri is currently paid, but Arsenal certainly don't seem to want to budge on their offer. The problem is, if we don't pay him what he wants, he'll have to be sold or otherwise we'll lose him for nothing next summer. We cannot afford to do that. The only solution to my mind is to try and meet him half way. If not, it appears we've seen Nasri in an Arsenal shirt for the final time. This summer we all thought Barcelona would be back with an offer for Cesc Fabregas, and whilst the Daily Star reports the Spanish champions will be making an offer of £40million, I got the feeling Arsene Wenger doesn't expect them to put up might fight to try and sign our captain during the close season. Perhaps he's under the impression they won't be as aggressive as they were 12 months ago and that Arsenal will be able to keep hold of their man. Perhaps I'm being lulled into a false sense of security by our manager's words. Or perhaps he's heard from on high that their isn't the appetite for such a public war of words with Arsenal. Only time will tell. One family member who doesn't offer the same diplomacy as the Fabregas clan is Nicklas Bendtner's father Thomas. He loves to shoot his mouth off, even dictating the transfer policy of Arsenal, with claims that £12million if a fair price for his son. "As an agent for Nicklas, I am not told the specific price that Arsenal want. Clubs will sort that out between each other. "Around £12m sounds very realistic. He has been higher, but the price goes down when he is not playing enough. "Nicklas has all the qualities to live up to that sort of money, and we can easily find him a club which wants to pay that amount of money." Yes Mr Bendtner, Arsenal would easily find a club who wanted to pay £12m - quite frankly it's a steal. A Danish international with both Premier League and Champions League experience - clubs would be snapping off Arsene Wenger's hand at that price. If Arsenal were to let him go for that price I'd seriously be tempted to cry. I know many don't have a lot of time for Bendtner, but he'll be a top striker in the future and I don't think we should be pricing him at such a low level - especially considering his development and ability. Arsenal fans are too easy to think any club would be prepared to pay £12m for Bendtner or £8m for Denilson are mad. But to me, those prices are not the true valuation of either players. I'd be adding at least a third to both prices. Anyway, Nicklas himself is being far more discreet about his possible departure - probably just in case it doesn't happen. He refused to discuss his future in north London when questioned by journalists. On father who does want to see his son sign for Arsenal is Mark Chamberlain, the dad of Southampton attacker Alex. He's told the Southampton Daily Echo he wants to see his son sign for Arsene Wenger "as soon as possible". A move was very close in January and I'm under the impression everything was sorted out on the player's contract but the south coast club didn't want to sell. Hopefully a deal can be reached this summer. A bit of transfer gossip. Wolfsburg goalkeeper Diego Benaglio has been linked with a move to Arsenal by Swiss newspaper Blick. This comes after the Sunderland Sun linked us with Craig Gordon. It does appear to be there will be some movement in the goalkeeping department but the types of goalkeepers we're being lined with don't appear to be the types who would want to come in and be third or fourth choice behind Szczesny and Fabianski. And talking of Szczesny, he appeared on a Polish TV show last night where he revealed that as an 11-year-old he headbutted a referee. He's got some balls! A few matters of any other business. Arsenal have revealed the names of players on international duty. Added to that list are Ignasi Miquel who will be in the Spain squad for the Under-20 World Cup to be held in Colombia between July 29 and August 20. Also called away on international duty is under-18s keeper Emiliano Martinez who will sit on the bench for the Argentina under-25s development side for their friendly against Nigeria today. Finally, if you've yet to read it please find the time to read the excellent Swiss Ramble's piece on Arsenal's transfer budget. An insightful read as always.